This makes it literary criticism. And why not? It’s a book about a book, in this case my exegesis of Henry’s Walden. But because SCIENCE: Earth Sciences: Geology is at the next level down, I prefer to think of my book as “geo-literary-criticism,” or “geocriticism,” akin to a recent trend for “ecocriticism” among environmentally leaning scholars of literature. If Walden’s Shore: Henry David Thoreau and Nineteenth Century Science, is geo-criticism, then so too is my 2017 book, The Boatman, which features Thoreau as a pioneering river scientist. 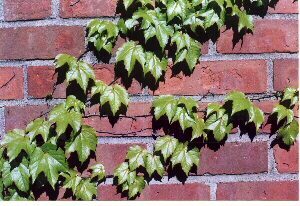 Photo: Ivy on Brick is a common sight in New England, especially at UConn.